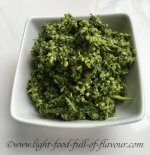 Trying to find a recipe for delicious fast food? This absolutely gorgeous, lightly smoked salmon dish takes very little time to make and is healthy as well. My problem with hunger is that when I’ve got time on my hands, I seem to go from not hungry to absolutely starving in seconds with nothing in between. If I’ve got a recipe to test drive I know now to start preparing the food when I’m properly full, as being in starving mode makes me immensely impatient. On the other hand, when I’m really busy on a job cooking food from the early hours of the morning until late at night, I lose my appetite almost completely. I've done a lot of long weekends with marathon shifts without eating much at all - apart from tasting the food I've been cooking of course. But as soon as I've finished my last shift, my hunger comes back with a vengeance! This recipe came about when I was at home writing one day and had some lightly smoked salmon fillets in the fridge and peas in the freezer. As I was not paying attention to the clock ticking away, I suddenly found myself starving and not in the mood for any time-consuming cooking. I decided to quickly fry the salmon, make mushy peas and top it with a yogurt and fresh mint sauce. Oh boy, it was divine! 1. Place the peas in a pan with salted water. Bring to the boil, turn down the heat and simmer for 1 minute. Drain the peas in a colander, put them back in the pan, add the butter, half of the chopped mint and some salt and pepper and mash with a potato masher. Keep warm. 2. Add the oil to a frying pan and fry the salmon pieces over a moderate heat for 2-3 minutes on each side. 3. Mix the rest of chopped mint with the yogurt. 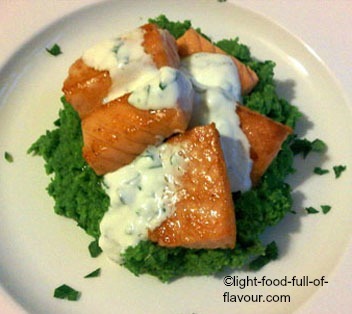 Divide the mushy peas between 4 plates and top with the salmon and dollop over some mint yogurt.